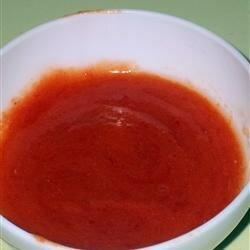 "This chicken recipe uses the original Buffalo wing sauce. Use as a marinade, pour over grilled chicken as a sauce or make and add chicken right to it!" Melt butter in a small saucepan over medium heat, or in microwave on high, until completely melted. Skim off white foam from the top and add hot sauce. Blend until well mixed, remove from heat and set aside until mixture starts to set. See how to make restaurant-style Buffalo chicken wings. Well this is good. But I perfer the thicker sauce in a deeper color. Yum! I love spicy food! DELICIOUS!!! nothing is to spicy for me! This is a milder version than some recipes I have seen, but it is easy to adjust the amount of butter and hot sauce to meet your tastes. It came a bit too buttery, but overall it was just the right level of hot. I would definetly put it on the wings as they cook.